Alphonse Gabriel Capone (January 17, 1899 – January 25, 1947), more popularly known as Al "Scarface" Capone, was a famous American gangster in the 1920s and 1930s, although his business card is reported to have said he was a dealer in used furniture. A Neapolitan born in New York, Capone began his career in Brooklyn before moving to Chicago and becoming that city's most notorious crime figure. By the end of the 1920s Al Capone was on the Bureau of Investigation's "Most Wanted" list. His downfall occurred in 1931 when he was indicted and convicted by the federal government for income tax evasion and sent to the notorious island prison of Alcatraz. He died in 1947 at his estate in Miami, Florida. Alphonse Capone was born to Gabriele Capone (1865–1920) and his wife Teresina "T(h)eresa" Raiola (December 28, 1867–1952) in Brooklyn, New York City, New York, at the turn of the 20th century. Gabriele was a barber from Castellammare di Stabia, a village reportedly situated about fifteen miles south of Naples, Italy. Teresina was a seamstress and the daughter of Angelo Raiola from Angri, a town in the province of Salerno. The Capones immigrated to the United States in 1894. Vincenzo Capone (1892–October 1, 1952). Called James Vincenzo Capone upon entering the United States. He left the family in 1908 to join a circus operating in the Midwest. Served as a lieutenant in the U.S. Army during World War I. Apparently changed his name to Richard Joseph Hart shortly after his discharge. He had a career as a law enforcement officer, served in the Federal Bureau of Indian Affairs and later became Marshal in Homer, Nebraska. Raffaele Capone (1894–November 22, 1974). Called Ralph upon entering the United States. Later joined his younger brother in Chicago. Salvatore Capone (1895–April 1, 1924). Better known as Frank Capone, he was a representative of his brother in Cicero, Illinois. Killed by members of the local police reportedly for attempting to draw a gun while they approached him. Alphonse Gabriel Capone (January 17, 1899–January 25, 1947). Erminio Capone (1901–?). Called John or affectionately "Mimi." Served prison terms for minor offenses such as vagrancy. Changed his last name to "Martin." Reportedly still alive in 1994. Umberto Capone (1906–June, 1980). Called Albert. Employee of the newspaper Cicero Tribune under the ownership of his brother Al. Changed his last name to Raiola in 1942. Amedeo Capone (1908–January 31, 1967). Called Matthew. Tavern owner. Alphonse's life of crime started early: as a teenager he joined two gangs, the Brooklyn Rippers and the Forty Thieves Juniors, and engaged in petty crime. Capone quit high school at the age of 14 when he fought with a teacher and worked odd jobs around Brooklyn, including a candy store and a bowling alley. After his initial stint with small-time gangs, Capone joined the notorious Five Points Gang headed by Frankie Yale. It was at this time he began working as a bartender and bouncer at Yale's establishment, the seedy Harvard Inn. It was here, at the Harvard Inn, that Capone would engage in a knife fight with a thug named Frank Gallucio after Capone had made a bold move on Gallucio's sister. Gallucio had deeply slashed Capone's right cheek with a switchblade, earning him the nickname that he would bear for the rest of his life: "Scarface," a moniker he in fact had deeply detested. Capone had instead preferred the nickname "Snorky" which meant "well-dressed" in the slang of the 1920s. In 1918 Capone married Mae Coughlin, an Irish girl, who gave him a son that year, Albert "Sonny" Francis Capone. The couple lived in Brooklyn for a year. In 1919 he lived in Amityville, Long Island, to be close to "Rum Row." Capone was still working for Frankie Yale and is thought to have committed at least two homicides, until being sent to Chicago in 1919. Yale sent his protégé to Chicago after Capone was involved in a fight with a rival gang. Yale's intention was for Capone to "cool off" there; little did he know that this would be the impetus for one of the most notorious crime careers in modern American history. The Capone family moved to a small, unassuming house at 7244 South Prairie Avenue in a Chicago suburb that would serve as Al Capone's first headquarters. Initially, Capone took up grunt work with Johnny Torrio's outfit, but the elder Torrio immediately recognized Capone's talents and by 1922 Capone was Torrio's second in command, responsible for much of the gambling, alcohol, and prostitution rackets in the city of Chicago. Severely injured in an assassination attempt in 1925, the shaken Torrio returned to Italy and gave the reins of the business to Capone. 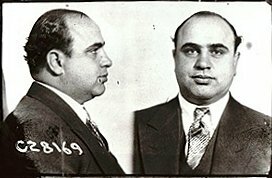 Capone was notorious during Prohibition for his control of the Chicago underworld and his bitter rivalries with gangsters such as Bugs Moran and Hymie Weiss. Raking in vast amounts of money from illegal gambling, prostitution and alcohol (some estimates were that between 1925 and 1930 Capone was making $100 million a year), the Chicago kingpin was largely immune to prosecution due to witness intimidation and the bribing of city officials, such as Chicago mayor William "Big Bill" Hale Thompson. Capone was reputed to have several other retreats and hideouts including French Lick, Indiana, Hot Springs, Arkansas and Johnson City, Tennessee. In 1928, Capone bought a retreat on Palm Island, Florida. It was shortly after this purchase that he orchestrated seven of the most notorious gangland killings of the century, the 1929 St. Valentine's Day Massacre. Although details of the massacre are still in dispute, and no person has ever been charged or prosecuted for the crime, the killings are generally linked to Capone and his henchmen, especially Jack "Machine Gun" McGurn, who is thought to have led the operation. By staging the massacre, Capone was trying to dispose of his arch-rival Bugs Moran, who controlled gang operations on the North Side of Chicago. Moran himself was late for the meeting and escaped otherwise certain death. Throughout the 1920s, Capone himself was often the target of attempted murders. Although Capone always did his business through front men and had no accounting records linking him to his earnings, new laws enacted in 1927 allowed the federal government to pursue Capone on tax evasion, their best chance of finally convicting him. He was harassed by Prohibition Bureau agent Eliot Ness and his hand picked team of incorruptible U.S. Treasury agents "The Untouchables" and IRS agent Frank Wilson, who was able to find receipts linking Capone to illegal gambling income and evasion of taxes on that income. The trial and indictment occurred in 1931. Initially, Capone pleaded guilty to the charges, hoping to plea bargain. But, after the judge refused his lawyer's offers and Capone's associates failed to bribe or tamper with the jury, Al Capone was found guilty on five of twenty-three counts and sentenced to eleven years in a federal prison. Capone was first sent to an Atlanta prison in 1932. However, the mobster was still able to control most of his interests from this facility, and he was ordered to be transferred to the infamous California island prison of Alcatraz in August of 1934. Here, Capone was strictly guarded and prohibited from any contact with the outside world. With the repeal of Prohibition and the arrest and confinement of its leader, the Capone empire soon began to wither. At Alcatraz, Capone went in with his cocky attitude. However, when he attempted to bribe guards, he was sent to the "hole", or solitary confinement. The same also stood for socializing, and eventually Capone's mental stability began to deteriorate. One example of his erratic behavior was that he would make his bed and then undo it, continuing this pattern for hours. Sometimes, Capone did not even want to leave his cell at all, crouching in a corner of his cell and talking to himself in gibberish. He began telling people that he was being haunted by the ghost of James Clark, a victim in the St. Valentine's Day Massacre. It was apparent over time that Capone no longer posed any threat of resuming his previous gangster-related activities. Sometime in the mid-1930s, and at Alcatraz, Capone began showing signs of dementia, probably related to a case of untreated syphilis he contracted as a young man. He spent the last year of his sentence in the prison hospital, and was released late in 1939. After spending a year of residential treatment at a hospital in Baltimore, he retired to his estate in Miami, FL. Capone was now a broken man. He no longer controlled any mafia interests. On January 21, 1947, Capone died of syphilis, a sexually transmitted disease, which is very harmful if not treated. In Capone's case, it resulted in Capone's death. Al Capone was frowned upon for being the most notorious, and popular American gangster of the 20th century by many inhabitants of western countries, the subject of numerous articles, books, and movies. He has been portrayed in film by Nicholas Kokenes, Wallace Beery, Paul Muni, Barry Sullivan, Rod Steiger, Neville Brand, Jason Robards, Ben Gazzara and Robert De Niro. Capone and his era were highlighted in the 1959 television film The Untouchables and its feature film and television series remakes which has created the popular myth of the personal war between the crime lord and Eliot Ness; he was also featured as an off-screen character in the 2002 film, Road to Perdition, set during a similar time period as The Untouchables. Capone also featured in the comic book, Tintin in America, the only case of a real person appearing as a character in The Adventures of Tintin. Capone is also one of the main characters in Peter F. Hamilton's epic The Night's Dawn Trilogy novels. Capone was also the subject of the mostly instrumental Prince Buster song Al Capone. He is also mentioned in another Buster song Too Hot, which went on to be covered by The Specials.